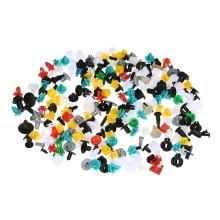 The auto fastener clips are made of high-quality nylon material, anti-wear and anti-corrosion. Widely used for door trim, fender, bumper, radiator shield yoke, side skirt, grille, etc. Quickly and easily remove car door panel and upholstery clips without damaging them. Package included 8mm button, 10mm button, door button, engine buckle, total 200pcs. Save your time and money. No need to go to a auto parts store for looking for different clips.